Usain Bolt- History Maker Creates More History!! Jamaica’s Usain Bolt had a slow slart but a marvellous finish to create a record nobody is sure would be surpassed or even matched any time in this generation ànd some say in this life time. With 9.81 seconds he won the 100m gold medal at the Rio Olympics. It was his third consecutive 100m gold, having won in Beijing in 2008 , London in 2012 and now in Rio 2016. Nobody in history has ever done so. The big man of track and field did in Rio what will be talked about for ages. He thrilled the crowd with his strides and their ovation was tremendous. Justin Gatlin of USA won the silver with 9.89 secomds. He was also in line for history if he won. Nobody had performed that feat 12 years apart. He won the gold in Athens Gàmes in 2004 ànd at 34 he was the oldest màn on the block for the finàl. 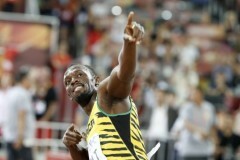 He had a blistering start and led the pack up even beyond the 50m mark before Bolt overtook him and finished in style. Canada’s Andre De Grasse won the bronze with 9.91 seconds. Hey Buddy!, I found this information for you: "Usain Bolt- History Maker Creates More History!!". Here is the website link: https://360kwado.com/usain-bolt-history-maker-creates-more/. Thank you.